Born 1959 on Mona Mona Mission, Ashley Coleman is an artist, musician, storyteller, and teacher of Djabugai language, songs and dances of his homelands. 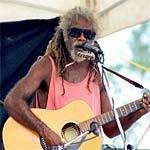 Ashley attended The University of Adelaide's Centre for Aboriginal Studies in Music (CASM), where he performed in other bands and choirs, as well as with his wife. He is a founding member of the Mantaka band in the early 1980s, and a founding member of the Gudju Gudju band early 1990s. Ashley now performs with his wife of 18 years, Ann-Maree Sloan Coleman. They sing in in Djabuganydji and English. To order copies of this CD, please email [email protected] ($20 each).